The Oil and Gas Journal reported on February 14, 2014 that Phillips will sell the Gold Product Pipeline System, also known as the “Gold Line System,” and the Medford Spheres, two newly constructed refinery-grade propylene storage spheres, to Phillips 66 Partners for a total consideration of $700 million. Medford Spheres includes two propylene storage systems located in Medford, Okla., with a combined capacity of 70,000 barrels. The units will serve as a temporary stopover for refinery-grade propylene coming from the Phillips 66 refinery in Ponca City, Okla., en route to the major natural gas liquids hub in Mont Belvieu, Texas. It also includes two lateral lines, and four terminals with 4.3 million barrels of aggregate storage capacity. The Ponca City News reported on December 31, 2013 that the purchase of the Specialty Products Unit by Warren Buffett's Berkshire Hathaway is expected to affect some of the 22 employees at the Marland Refinery Ponca City who work in the flow improver business. No layoffs or city relocations are expected and it is anticipated that affected employees will transfer to the purchasing company according to Phillips 66 public relations. Reuters reported on December 4, 2013 that Phillips reported an unspecified malfunction on November 27, 2013 at the Ponca City Refinery in a filing made with the Oklahoma Department of Environmental Quality. Phillips Finance and Chief Financial Officer Greg G. Maxwell told analysts at the third quarter earnings conference that Phillips' advantage crude sale in the U.S. was 66% this quarter down from 68% last quarter "This decrease is mainly tied to Bakken and albeit in the economically advantaged during the third quarter and the scheduled turnaround at our Ponca City Refinery," said Maxwell. "Our refining segment reported a loss of $2 million this quarter. This is down $483 million from the prior quarter primarily due to lower margins particularly in the Central Corridor, Western Pacific and other refining. While the Central Corridor and Western Pacific regions where down due to decreased market cracks and other refining results were lower this quarter largely driven by lower earnings from utilizing the excess capacity on pipelines that import Canadian crude." The Ponca City News reported on September 30, 2013 that two 232 ton coker reactors manufactured in Japan were moved into place into two slots on the working platform at the Marland Refinery in Ponca City on September 29, 2013 and carefully lowered into position by the Mammoet PTC-140 heavy lift crane. The Tulsa World reported on August 28, 2013 that Phillips CEO Greg Garland spoke at the Bartlesville Chamber of Commerce on August 27, 2013. During his talk Garland called the refinery at Ponca a 'core asset' for the company. “It is making very good money for us.” Garland said he expects gas demands in the U.S. to decline by 20 percent in the next 10 years, but added that demand for refined products in South America and Africa will more than offset that decline. Garland added that Phillips has added 38 new jobs at its refinery in Ponca City since Phillips became an independent company in 2012. The Ponca City News reported on August 14, 2013 that fifteen positions in the Lubricants Research, development, and Customer Services section will be moved from Ponca City to Bartlesville and other Phillips locations beginning in August, 2013. The reason given for the move is to co-locate these functions with similar work at other locations. Phillips says that no other positions will be affected at the Marland Refinery in Ponca City and that there will be no layoffs. The DOE reported on August 9, 2013 that Phillips is set to replace two giant drums on the coking unit at its Marland Refinery Ponca City in October, according to sources familiar with operations at the refinery. The coking unit will be shut to lift out the current drums and put the replacement drums in the unit, the sources said. Greg Garland told analysts at Phillips 2nd Quarters earnings conference on July 31, 2013 that Phillips set a new quarterly record of 181,000 barrels a day at the Marland Refinery in Ponca City. Greg Garland told analysts at Phillips 2nd Quarters earnings conference on July 31, 2013 that Phillips commissioned a high-capacity truck facility at the Marland Refinery in Ponca City providing additional access to Mississippian Lime crude. "We continue to increase our refined product exports. In the second quarter, we set a new quarterly record of 181,000 barrels a day." The Ponca City News reported on July 23, 2013 that the base for the 587 foot tall Mammoet PTC 140 crane has been put in place at the Marland Refinery in Ponca City. Bloomberg reported that Phillips 66 shut units at its Ponca City refinery in Oklahoma on July 11 after a power disruption, Houston-based spokesman Rich Johnson said. The refinery planned to restart late on July 12, 2013. On July 15, 2013 Phillips reported that the refinery had returned to normal operation on July 12, 2013. Russ Morgan reported on the Winfield Daily Courier On Juy 11, 2013 that final terms to begin construction of the Cowley County leg of the Pony Express Pipeline are being negotiated, and the company intends to begin work on it sometime in late August. The pipeline will be used to ship light, sweet crude from Guernsey, Wyo., to the Phillips 66 refinery in Ponca City and to shipping points in Cushing, Okla. One complication of the project is that ownership of the pipeline has changed since October from Kinder Morgan to Tallgrass Energy Partners. The Ponca City News reported on June 28, 2013 that massive flararing occurred at the Marland Refinery at Ponca City the evening of June 27, 2013 during a large thunderstorm that hit Ponca City and caused widespread power outages. Flaring occurs many times during power outages when plant operations are interrupted and are a safety measure to burn off gases from pressure relief valves. Louse Abercrombie reported in the Ponca City News on June 23, 2013 that plans to invest $70 million in the Marland Refinery in Ponca City to replace two huge coke drums that were first installed at the refinery in 1982. “This fall the coker units will be shut down for maintenance so these drums can be switched out,” said Betsy Johnson, Coke Drum Project Manager. The coke drum replacement will allow heavier oil and the refinery is expected to slow down but not shut down as the new coke drums are installed. The coke srums were produced in Japan and shipped through the Panama Canal to New Orleans and by barge to Catoosa. About 100 extra workers are now at the refinery preparing for the installation and another 50 are expected during the installation. 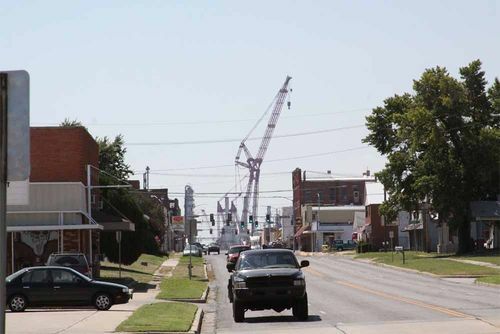 The Ponca City News reported on June 13, 2013 that one of the worl's largest cranes, believed to be a PTC-200 DS model crane is being assembled at a staging area at the corner of South Pine Street and South Avenue. The unit, said to be arriving from a previous job in Brazil, will be used to move two coker reactor units within the refinery. The supercrane, built by Dutch firm Mammoet, is fitted with four 800t main winches capable of lifting 3,200 tonnes loads at a maximum hoist speed of 10m per minute. Sources say that the crane when assembled will be over 700 feet tall and will be visible from I-35 15 miles away in Tonkawa. Sources also say that an old coker unit in the refinery will be removed using the crane and a new one installed. Reuters reported on May 21, 2013 that Phillips' refinery in Ponca City was not affected by the severe weather on May 20, 2013 when a massive tornado hit Moore, Oklahoma. Phillips reported on May 21, 2013 that the company will contribute $1 million to the American Red Cross to assist in the relief efforts following the tornadoes that struck Mooe and Shawnee Oklahoma. "Our company's roots run deep in Oklahoma, and our thoughts and heartfelt prayers go out to the people affected by this disaster,” said Greg Garland. “We are extremely thankful that all of our employees in Oklahoma and their immediate families are safe. We thank the first responders and medical personnel that came to the rescue of so many." Nasdaq reported on April 3, 2013 that several units at the Marland Refinery in Ponca City were temporarily shut down over the weekend due to storms. Phillips was making progress toward restarting some units and some units have been restarted. Eliot Caroom reported on Bloomberg on March 20, 2013 that Phillips has signed a pipeline deal with Magellan Midstream Partners LP (MMP) to move 20,000 barrels a day of crude to the Marland Refinery in Ponca City, replacing West Texas Intermediate from Cushing with oil from the Mississippian Lime play. Magellan service will begin in late 2013, reaching full volume by January 2014. The Tulsa World reported on February 20, 2013 that Oscar-nominated director David O. Russell will reunite with Oscar winner Jennifer Lawrence in the movie "The Ends of the Earth" about Oilman E. W. Marland founder of the Marland Oil Campany and builder of the Marland Refinery in Ponca City, Oklahoma and his wife Lydie Marland. The Weinstein Company (which made "Silver Linings Playbook" with Lawrence and Russell) has described the film as "the epic love story, based on true events (as) powerful oil tycoon Ernest Marland loses everything after engaging in a controversial love affair with his adopted daughter Lydie." The previously announced film - likely a 2014 or 2015 release - will be written by Chris Terrio, the screenwriter of best-picture Oscar film "Argo." Lynn Doan at Bloomberg reported on February 7, 2013 that a gasoil hydrotreater was shut down for short-term repairs at the Marland Refinery in Ponca City. Workers began shutting down equipment about two weeks ago for short-term maintenance turnarounds, said the person, who asked not to be identified because the information isn’t public. Phillips recently finished repairs on the amine treater and shut a gas plant associated with the coker and a gasoil hydrotreater for work that may last two more weeks, the person said. In the fall, the coker will be out of service for work the person added. Cokers convert heavy refinery streams, such as vacuum bottoms, into light products such as naphtha and heating oil. Hydrotreaters remove sulfur, metal and other impurities from refined oil products. Rich Johnson, a spokesman at company headquarters in Houston, said by e-mail that planned maintenance is under way in Ponca City. He declined to comment on specific units. Rich Cantillon reported in the Ponca City Chamber of Commerce online Newsletter on February 1, 2013 that Phillips honored E. W. Marland by hosting a tour of E. W. Marland's office and the Marland Oil Company Board Room for members of Ponca City Government, the Ponca City Chamber of Commerce, and the Ponca City Development Association (PCDA). 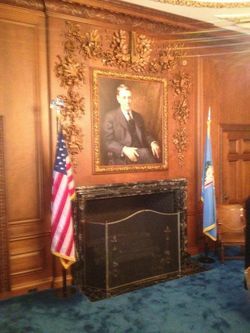 "Hand carved designs are everywhere in what was the board room and Marland's Office," wrote Cantillon, Executive Director of the Ponca City Chamber of Commerce. "This is an incredible part of Oklahoma oil history right here in Ponca City! It has been kept just like it was when E.W. Marland worked in this office and ran his oil company." City officials met with Phillips Refinery Manager Pete Stynes, Phillips HR Manager Bob Gingerich, and H.J. Reed, Phillips Manager for State Government Relations who was in Ponca City to give an update on what to expect in the upcoming legislative session. The Ponca City News reported on January 13, 2013 that a 463,000 pound replacement coker unit had arrived in Ponca City for installation at the Phillips 66 Refinery. The unit, manufactured in Japan, will be prepared at a staging area at Standing Bear Park for later installation at the refinery. The Ponca City News reported on December 25, 2012 that Phillips CEO Greg Garland visited Ponca City accompanied by Larry Ziemba, Executive Vice President Refining; Merl Lindstrom, Vice President Technology; and Michael Wirkowski, General Manager, Refinery Business Improvement. Garland his team were welcomed to Ponca City by Mayor Homer Nicholson, a 38-year veteran of Conoco and ConocoPhillips before his retirement; David Myers and Larry Murphy with the Ponca City Development Authority; City Manager Craig Stephenson; civic leader Carl Renfro; Pete Stynes, Phillips 66 Refinery Manager in Ponca City; and Lee Evans and Rich Cantillon with the Ponca City Chamber of Commerce. This was Garland's first public visit to Phillips 66's most profitable refinery since becoming CEO. Garland cancelled a previous visit to Ponca City scheduled for March, 2012. Tim Taylor reported at the Phillips Third Quarter Earnings Conference on October 31, 2012 that Phillips had increased the amount of crude processed at the Ponca City Refinery and is also ramping up deliveries of locally produced Mississippian lime crude into the Ponca City refinery via pipeline and truck. 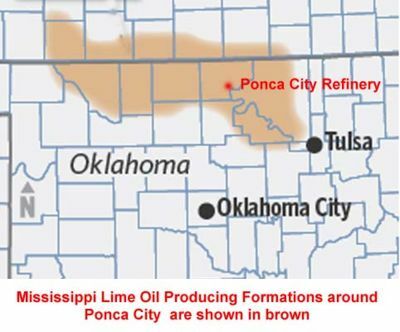 "We expect to receive up to an additional 50,000 barrels per day of this high-quality crude into Ponca City by the end of 2013." 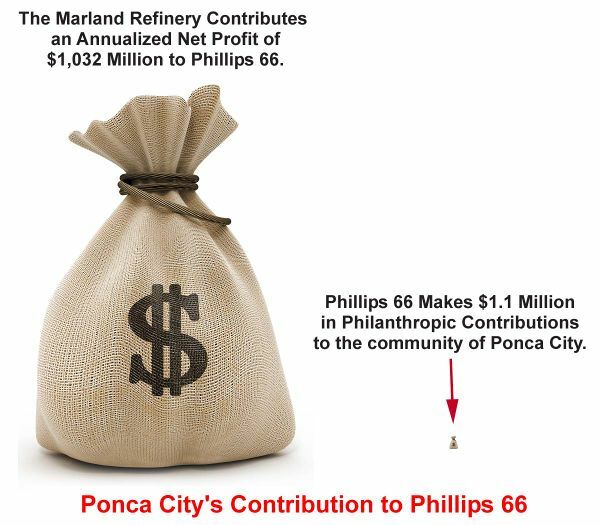 The Ponca City Refinery earned profits in excess of $500 million in 2011 for Phillips 66 and based on Phillips' third quarter earnings report for 2012 with a realized crack spread of $31.83 for mid-continent refineries and a capacity utilization of 102%, the Marland Refinery in Ponca City will contribute at an annualized rate of over $1 billion ($1.032 B) of net profits in 2012 to Phillips bottom line. The Ponca City News reported on October 14, 2012 that Refinery Manager Pete Stynes spoke to the Ponca City Lions Club on October 10, 2012 about Phillips 66's Refinery in Ponca City. Stynes said that 800 employees work at the refinery with the direct employment of 625 Phillips employees. Stynes said the local oil boom, as well as discoveries of light crude in North Dakota and other parts of the country, have resulted in a profitable time for the refinery. Stynes said that Phillips employees contribute thousands of dollars to local organizations — much of it matched by Phillips 66 - and that Phillips employees put in many volunteer hours with at least 40 employees serving on the boards of directors of local charities. The Oil and Gas Journal reported on August 8, 2012 that the Pony Express Pipeline company has received sufficient binding shipper commitments to move forward with its Pony Express Oil Project that will deliver crude oil from receipt points near Guernsey, Wyo., to the Phillips 66 Ponca City Refinery as well as to Cushing, Okla. The 220,000 b/d pipeline will enter service third-quarter 2014. The project involves converting 430 miles of existing pipeline from natural gas to oil service, and constructing a 260-mile pipeline extension from the existing pipeline to Ponca City and Cushing. The Tulsa World reported on August 6, 2012 that the Weinstein Company, producer of the last two Academy Award winners for best picture: "The King's Speech" and "The Artist," is attached to topline the romantic drama "Ends of the Earth," written by Chris Terrio and based on the lives of EW and Lydie Marland, in a story that follows the controversial love affair between an oil baron and his adopted daughter, which destroys the empire they built together. "Chris (Terrio) has brought to life with his writing one of the most epic love stories that people have yet to really discover," said Dylan Sellers, Weinstein Company president of production. "We knew right away that this script was something special." Jennifer Lawrence, star of "The Hunger Games," is attached to play Lydie, an educated, headstrong woman who was adopted as a girl by her aunt Virginia and uncle Ernest who later becomes their adopted daughter and eventually becomes EW's wife. According to the screenplay, Lydie urges EW to raise workers' wages at the Marland Refinery and give them unpredecented access to medical care, earning her the nickname the "princess of the prairies." Todd Black, Jason Blumenthal and Steve Tisch will produce the movie for Escape Artists, which is aiming to start production in the summer of 2013. Reuters reported on Phillips second-quarters earnings report on August 2, 2012 that Phillips is working to run more shale crude from the Mississippi Lime play in Oklahoma and Kansas at its 198,400 bpd refinery in Ponca City, Oklahoma by trucking crude from the company's existing gathering systems. Rod Walton reported in the Tulsa World on September 24, 2011 that Mississippi Lime - porous limestone formations in northern Oklahoma and southern Kansas has been yielding reservoirs to horizontal operators such as SandRidge, Chesapeake, Devon and Tulsa-based Eagle Energy LLC during the past two years. The "new" reserves actually lie slightly below formations that were big producers 100 years ago. Phillips Petroleum Co., for instance, made its name in the nearby Burbank Field, on the eastern edge of the play that includes Osage, Pawnee, Kay, Garfield, Woods, Alfalfa and other northern Oklahoma counties. "It's sort of amazing that all of this has been sitting there and waiting for horizontal drilling," says Eagle CEO Steve Antry. "The vertical wells hardly drained any of that." The move now is toward the deposits containing mostly oil and natural gas liquids. The Mississippi Lime's ratio is often 52 to 55 percent oil, according to reports. "We're into the second tier of this renaissance," says Chip Minty, a spokesman for Oklahoma City-based Devon Energy Corp. "Now what we're doing is taking the same technology beyond the shales to the carbonates, such as limestone." One advantage of the Mississippi Lime is that limestone's porosity and natural fractures can mean less expense on the drilling and hydraulic fracturing parts of the project. Expenses can total half and even a fourth of typical unconventional well efforts. Another advantage is that there is already plenty of seismic data available for the area from past exploration and drilling. "It's a reasonably low-cost play where hydrocarbons have been found before, with a lot of wells drilled in the past," says RAM spokesman Robert Phaneuf. 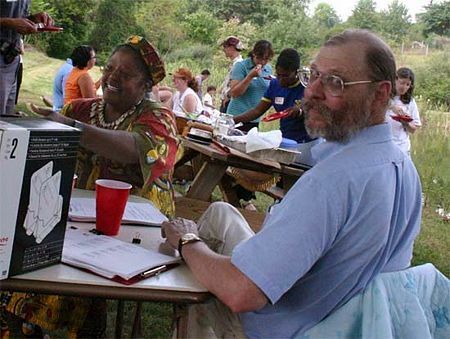 And that gives you good data points." The Ponca City News reported on July 31, 2012 that what might have been a major disaster at the Ponca City Refinery was narrowly averted when a concrete pillar prevented an out-of-control rock-hauling truck from plowing into critical piping at the south refinery along US 60. Oklahoma Highway Patrol Trooper Jason Ross reported in his investigation the truck was traveling eastbound on US 60 approaching the railway overpass when it went into the steel guardrail on the right side and continued for 625 feet before then crashing through cement barriers and fencing around the refinery plant and striking a barrier around exposed pipes, traveling another 295 feet before crashing head-on into the concrete pillar at the base of the refinery operation. Refinery spokeswoman Diane Anderson says the refinery production operation was not affected and that major damage to the plant was narrowly avoided. Reuters reported on July 10, 2012 that planned maintenance is taking place at the Ponca City Refinery. Phillips 66 did not say when the maintenance work started or how long it is expected to last. Phillips 66 completed maintenance work on July 19 at Ponca City refinery on July 19, according to traders doing business with the refinery. ↑ Retuers. "Phillips 66 reports hole in a line to FCCU at Ponca City, OK refinery" February 10, 2014. ↑ Phillips 66. "Berkshire Hathaway to acquire flow improver business from Phillips 66" December 30, 2013. ↑ The Ponca City News. "Berkshire Hathaway Acquiring Phillips Specialty Products" December 31, 2013. ↑ Reuters. "Phillips 66 reported malfunction at Ponca City refinery" December 4, 2013. ↑ Ponca City News. "A Tight Fit" September 30, 2013. ↑ Tulsa World. "Phillips 66 CEO addresses fuel efficiency, overseas market" by Susan Hylton. August 27, 2013. ↑ Research and Ideas. "Report from Greg Garlands Address to the Bartlesville Chamber of Commerce" August 27, 2013. ↑ Bartlesville Examiner. "Phillips 66 CEO praises city" by Kelcey King. August 28, 2013. ↑ Ponca Cty News. "Phillips Begins Moving Some Jobs to Bartlesville" August 13, 2013. ↑ Ponca City News. "Large Base Put in Place" July 23, 2013. ↑ Inside Futures. "The Energy Report 7/15/13" by Phil Flynn. July 15, 2013. ↑ Winfield Daily Courier. "Pipeline construction could begin soon" by Russ Morgan. July 11, 2013. ↑ The Ponca City News. "Large Flare" June 28, 2013. ↑ Ponca City News. "Huge Crane Prepares for Refinery Project" by Louise Abercrombie. June 23, 2013. ↑ Ponca City News. "Massive Crane Unloaded" June 13, 2013. ↑ Cranes Today. "Mammoet unveils fast-lifting mega-cranes" June 17, 2011. ↑ Phillips 66. "Phillips 66 Contributes to Oklahoma Tornado Relief Efforts" May 21, 2013. ↑ Nasdaq. "Refinery Status: Phillips 66 Progressing Toward Restarting Ponca City, Okla. Units" April 3, 2013. ↑ Tulsa World. "David O. Russell to direct Marland movie" by Michael Smith. February 20, 2013. ↑ Bloomberg. "Phillips 66 Ponca City Treater Said Shut, Coker Outage Planned" by Lynn Doan. February 7, 2013. ↑ Ponca City Chamber of Commerce. "Chamber Chat by Rich Cantillon" February 1, 2013. ↑ Ponca City News. "Coker Unit Arrives" January 13, 2013. ↑ Ponca City News. "All Welcome in Special Meeting" December 25, 2012. ↑ Tulsa World. "Jennifer Lawrence cast as former Oklahoma first lady Lydie Marland in new film" by Michael Smith. August 6, 2012. ↑ Variety. "Jennifer Lawrence travels to 'Ends of the Earth'" by Jeff Sneider and Rachel Adams. August 6, 2012. ↑ Ponca City News. "A Close Call: July 31, 2012. ↑ Reuters. "Planned work under way at Ponca City refinery - Phillips" July 10, 2010. ↑ NASDAQ. "Refinery Status:Maintenance Work Completed At Phillips 66 Ponca City, Oklahoma Refinery" July 20, 2012. This page was last modified on 22 April 2014, at 13:27.